BP has launched a new driver and fuel management platform designed in partnership with TomTom Telematics to help fleets cut costs. Dubbed BP FleetMove, the product is available in two solutions to target the needs of smaller and larger fleets, and combines BP fuel card transaction details with vehicle and driver performance data via the TomTom Telematics Service Platform to feed vehicle and driving information to fleet managers with the help of the TomTom Curfer smartphone app. The Plug-in & go BP FleetMove is aimed at smaller fleets and has a one-off setup cost of £39.35, with no professional installation or long-term contracts required. Features include the ability to access accurate vehicle data from a central dashboard and access an individual range of shared data from BP and TomTom Telematics including fuel consumption, CO2 emissions and driver efficiency scores. It also provides drivers with real-time advice to improve performance while providing other features via the TomTom Curfer smartphone app, including the ability to quickly find the nearest BP or ROUTEX station and view fuel consumption data while on the road. BP FleetMove PRO adds fuel card transactions to driver and vehicle performance reports. 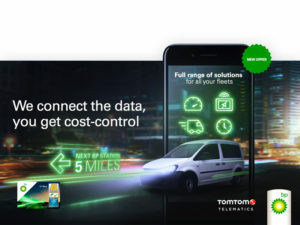 Features like vehicle location, fuel consumption, driver behaviour performance and vehicle maintenance information from TomTom WEBFLEET all combine with BP fuel card information to provide full visibility and control over how fuel is being used. BP FleetMove PRO is fully compatible with all vehicles regardless of brand or type – cars, vans, trucks or buses – while live services such as traffic updates keep drivers out of hold-ups and provides managers with ETAs. Andy Allen, UK fuel card manager, BP Fuel Cards, said: “At BP, we are constantly looking for ways to help fleets save time and money by providing efficiencies and real-time insight.